Nearly three decades since they first came together during informal sessions at O'Donoghue's Pub in Dublin, the Dubliners remain one of the most influential of Ireland's traditional folk bands. Unlike their counterparts the Clancy Brothers, the Dubliners have never strayed from the raw looseness of the pub scene. According to Dirty Linen, "Whereas the Clancys were well-scrubbed returned Yanks from rural Tipperary, decked out in matching white Arab sweaters, the Dubliners were hard-drinking backstreet Dublin scrappers with unkempt hair and bushy beards, whose gigs seemed to happen by accident in between fist fights". Initially known as the Ronnie Drew Folk group, the Dubliners have gone through several personnel changes since they were formed in 1962. The original group featured Ronnie Drew on vocals and guitar, Luke Kelly on vocals and five-string banjo, Barney McKenna on tenor banjo, mandolin, melodeon, and vocals and Ciaren Bourke on vocals, guitar, tin whistle, and harmonica.The first change occurred in 1964 when Kelly left temporarily and Bobby Lynch (vocals and guitar) and John Sheahan (fiddle, tin whistle, mandolin, concertina, guitar, and vocals) were added. The following year, Kelly returned and Lynch departed. The Dubliners' earliest recordings included appearances on multi-artist compilations The Hoot'nanny Show and Folk Festival: Festival Folk, released in 1964. Their first break came when they met Nathan Joseph, owner of Transatlantic Records, at the Edinburgh Festival in 1963. Signing with Joseph's label, the group released their debut full-length album, The Dubliners, later the same year. In 1967, the Dubliners recorded their breakthrough single, "Seven Drunken Nights," based on Child Ballad number 273. Although its risque lyrics caused it to be banned from officially sanctioned radio stations, it became a Top Five hit after being aired by pirate radio station, RTE. With the song's success, the band began touring throughout the world. 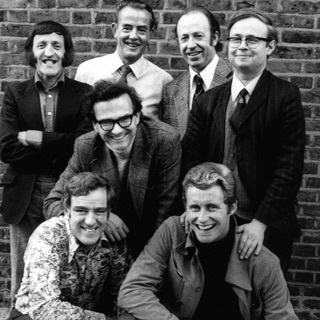 In the early '70s, the Dubliners toured in a production of Brendan Behan's Cork Leg. A second phase of personnel changes began in 1974 when Bourke suffered a brain hemorrhage during a show. Although he subsequently appeared to have recuperated and rejoined the group, he collapsed again on the stage and left for good. He died on May 10, 1988 at the age of 53. Following Bourke's first departure, Ronnie Drew left to pursue a solo career and was replaced by Jim McCann. With Drew's return five years later, McCann departed. The group's problems, however, were not over. In the same year, Kelly collapsed from a brain tumor during a concert and was required to undergo several surgical operations. He died on January 30, 1984, at the age of 44. Seán Cannon was drafted into the line-up at this time.